Adding the Formax V-Stack36 Vertical Stacker in-line with your machine takes the worry out of having a perfectly stacked finished product. The V-Stack36 neatly stacks up to 22 inches of folded documents. Unlike a traditional outfeed conveyor, it stacks forms vertically, providing a neat stack which is easier to unload for further processing. This is an optional item, and can be purchased separately on our site at any time. The fully automatic FD 382 Document Folder is the ideal folding solution for any church, school or business which demands quick and easy setup. Six common folds are pre-set for 11", 14" and 17" (Int'l Sizes A3, B4, A4, B5, A5 & B6) paper and can be activated with the touch of a button. Additionally, up to nine custom folds can be programmed and stored in memory. All the settings are easily made with the centrally located control panel and LED. The Telescoping Outfeed Stacker holds up to 500 folded documents. This unique feature enables operators to load the in-feed hopper and let it run out before removing the folded forms for most applications. The Optional Dedicated Multi-Sheet Feeder gives operators the ability to fold up to three 20# (75 gsm) sheets of stapled or unstapled paper at the same time. AutoBatchTM is a unique batch counting system that allows operators to key in a pre-determined number of sheets to be pulled into sets with a programmed delay between each set for easy paper handling. With these unmatched features, the FD 380 clearly sets the new standard for automatic paper folding. The FD 380 is capable of processing paper up to 18"(432mm) in length and up to 12.25"(311mm) in width giving it the flexibility to process a variety of paper sizes. The ability to customize jobs allows operators to fold in virtually any configuration that only requires two folds. Cross folding adds to the FD 380's flexibility allowing for additional folds in a second pass. The unique semi-automatic Dedicated Multi-Sheet Feeder is designed with an independent skew adjuster, side guide adjuster and paper sensor allowing operators to accurately fold stapled and unstapled sets of precollated documents with up to three 20#(75gsm) sheets. Self centering side guides and a skew adjuster ensure that paper is loaded and feeds squarely into the folder. Fine tuning knobs on the fold plates allow operators to precisely set the fold positions. Pre-programmed folds, automatic fold adjustments, and a centrally located control panel make for easy setup and operation. The Telescoping Outfeed Stacker, with an unprecedented stacking capacity of up to 500 folded documents, cuts down on unloading time and ensures that the forms remain in a neat and sequential order. The unique AutoBatchTM or "automatic batch" allows operators to batch count with automated features. In the AutoBatch mode, operators can program the number of sheets to be processed in a set, the number of sets needed and the delay between each set. Incredibly speedy machine - it takes longer for machine to adjust folding plates than it does to fold. However, it is NOISY - I recommend ear plugs. We are very pleased with the purchase (although the office next to us might not be). Welcome to MyBinding video. 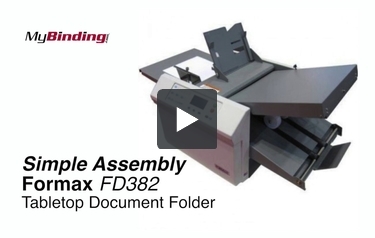 This is the simple assembly of the Formax FD382 and it really is simple. This thing cranks and you can get started fast. Let’s start on the right side or the top tray. Set on the inside of the machine are four metal pin rests. Taking the longer of the two folding tray, rest it down on top of those pins. No forcing needs to be done. It will simply go right in and click down. And make sure those grooves go down over the pin rests. And then there’s this plug. It plugs in right here. Make sure you check the pins on it too. No jamming and shoving. Get them lined up, put them in right. And now the left side or the bottom tray. Make sure the feeder tray table is upright and locked and locate the pins that are on the bottom on the inside here as well. And on these four pins you’ll do the same thing. Gently load in the smaller of the two trays, up and in and down and resting. Make sure it’s seated and it doesn’t wobble, and plug it in. Again, check the pins, make sure you’re doing it correctly. And the one last thing before you give our customer service department a call, you got to plug it in to the wall and to the machine itself. Power button’s on the left hand side and you’re ready to go. Happy Folding. For more demos, reviews and how-to’s, check out MyBinding.com. Welcome to MyBinding video. This is the Formax FD382, a tabletop document folder, and a pretty good one too. So here’s your home base: a touch pad LCD screen, lets you know all that you’re doing. With the push of a button, you can do pre-programmed folds, customizable folds, auto batch, custom batch, variable speeds, custom counters, operator settings and much more. When selections are made and you’re ready to go, pull down the receiving tray and load your paper. To do so, use the lever on the right side of the feed tray. With the tray in the up and open position, stack your papers. And then use the side margin controls to center your stack of paper. Use the knob on the top of each fence to tighten it down, not too tight. When you’re satisfied, things look good and centered, drop the lever and the paper goes into position. Double check your batch, sizes and fold selections. Just to the left of the screen are quick selection buttons used for common folds and speed settings. Always fire off a test run with this black button here. And if you’d like more than just one sheet for a test, you can set that in the program to do three, four, five sheets for a test. If everything is great, hit the green button for go and it will work through your entire stack and lineup. It folds 20-100 sheets per hour and does so incredibly consistently. Unlimited folding options are a reality as you can add to the pre-programmed common folds any customized size you need. Should papers come out slightly skewed, there’s a fine tuning knob right here, just to the right of the feed tray. And on the left side, just below the bottom tray, once you pull it out there’s a small little widget. And this little guy allows you to do multiple folds on the same piece of paper. Once you’ve folded everything once, you can place them back into the feed tray, rest the wheel on top. It will hold it in place as the process happens. There it is, that’s a great machine, the Formax FD382. For more demos, reviews and how-to’s, check out MyBinding.com. The FD382's hopper can theoretically hold an entire ream of paper: 500 sheets. Depending on the settings you use, you will be able to fold just over 20,000 sheets in one hour. 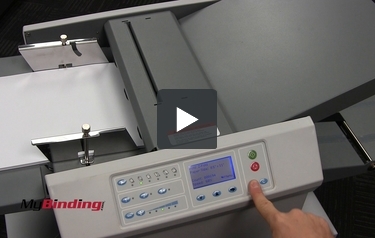 This machine will definitely help you prepare your documents in a short amount of time. This machine will work with various sizes of paper including letter- and legal-sized sheets. It's also capable of working with some international paper sizes including A4. The smallest sheets you can use with this device measure 3.5" x 5". The largest measure 12.25" x 18". The FD382 is pre-programmed to do the following folds: letter, single, gate, double parallel, zig-zag, and fold out. It can also do cross folding. There is a guide included so you can use this feature successfully. Also, you can do some custom folds with this device, so it's pretty versatile. This paper folder has a lot of features that make it very user-friendly. Some of these features include a variable speed control, manual batch counter, an AutoBatch mode, and a fault detector that will stop the machine in case something goes wrong. This device also has a drop-in feed system so you won't need to fan the paper beforehand. And best of all, this machine operates quietly so you can fold as much paper as you need without disturbing those around you. Finally, the FD382 is well-constructed so you should be able to get a lot of use out of it. The machine is backed by a 1-year warranty. This machine's main weakness is its size. When it's closed up, it measures 19" (height) x 20" (width) x 33" (depth). When it's extended, it measures 19" (height) x 20" (width) x 60" (depth). This is definitely not a desktop device and you will need a significant amount of room for it. The FD382 is meant for heavy-duty use so it might be a bit much if you're looking for a paper folder for light, occasional use. As you can see, the Formax FD382 Automatic Document Folder is a terrific machine that can help you fold your documents quickly and easily. This device is very versatile and it can handle many different sizes of paper. Plus, the machine has a lot of special features including the ability to fold about 20,000 sheets per hour. The main thing you need to keep in mind about the FD382 is its size. This device is very large so you will need a lot of room for it. But if you have the space and the need for it, check out the FD382 today! Can the Formax FD382 handle heavier weight papers? Thank you for your question. We reached out to Formax and they advised that because of the differences in how different stocks fold for anything above 32# stock they are not able to provide a definitive answer. What Formax prefers to do is test the machine with a sample of your stock before purchase to be sure it will work. If you contact out customer service department at 1-800-944-4573 we can help set that up.